“In the Good Old Summer Time” shares nostalgic space with another old, familiar tune of the season: “Summer time and the livin’ is easy.” Summertime for the Longenecker family may not have been easy in the 1950s what with tomato field hoeing, canning, freezing vegetables from the garden, but it was simple. This is a pict-o-logue of summertime for me from 13 months to about age 13. “Naked in a tub” would be a sensational caption for this photo were it not for the fact that I’m only 13 months old. Later I recognize that this glistening galvanized tub is also used for blanching sweet corn ears from the garden lot. 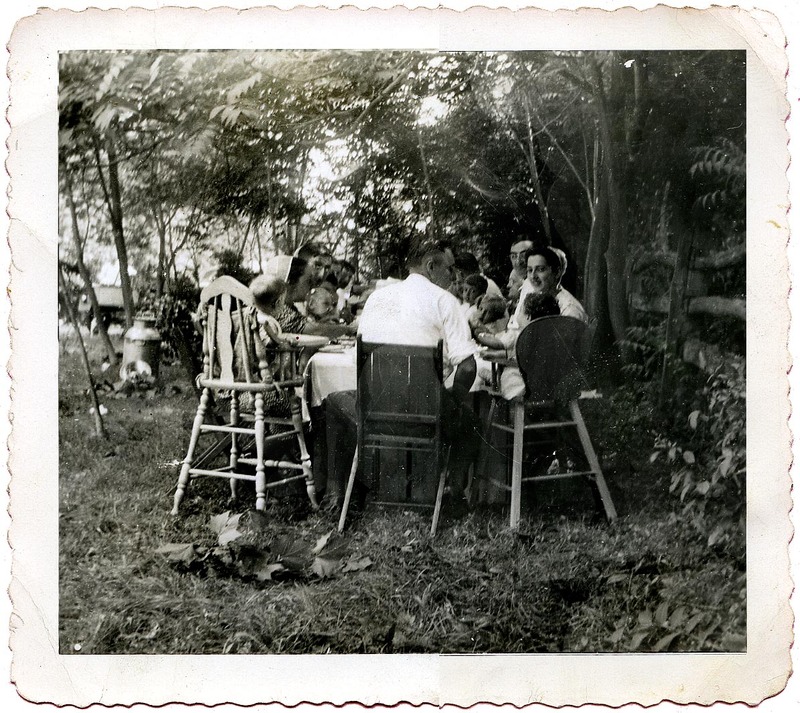 Reminiscent of Manet’s Le Dejeuner sur l’herbe (yes, it’s a stretch) but in a far simpler, Mennonite style, the Metzlers on Mother’s side of the family gather for a Sunday summer picnic In Uncle Clyde’s meadow, large crates holding up the table. After dinner the children scatter, the women clean up, and the men take down the table. I won’t be surprised when one or two of my uncles might light up a cigar rolled from home-grown tobacco. 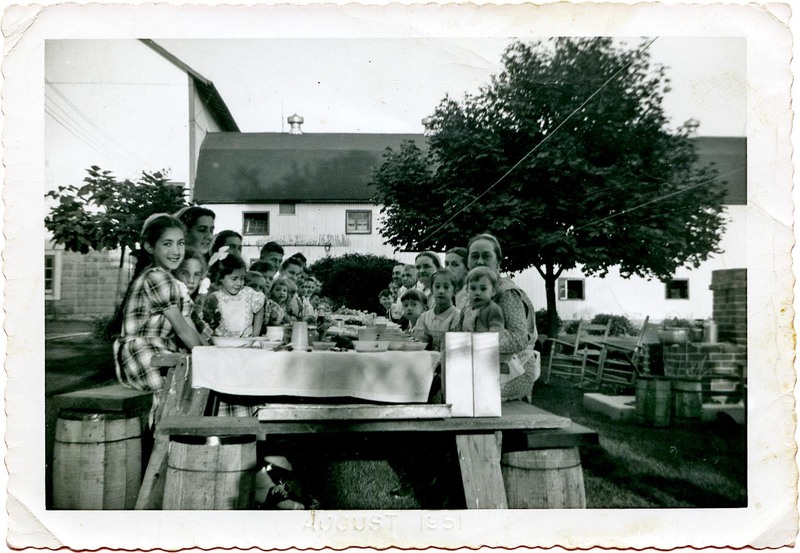 Uncle Leroy and Aunt Clara’s farm is the perfect place for a summer Sunday dinner on the lawn. Hefty barrels hold up this groaning board as we pass around the seven sweets and seven sours, every family bringing a dish to another Metzler reunion. I also have a turn visiting Uncle Frank Martin’s household, one of Grandma Longenecker’s younger brothers. Aunt Mattie braids my pig-tails every morning as I sit in her kitchen looking up at the tall ceilings. She plaits very slowly because she doesn’t have much experience with little-girl hair. Her girls, Joyce and Janet, are not plain and have naturally curly hair that hangs free. They both wear shoes with open toes, a detail not lost on me. 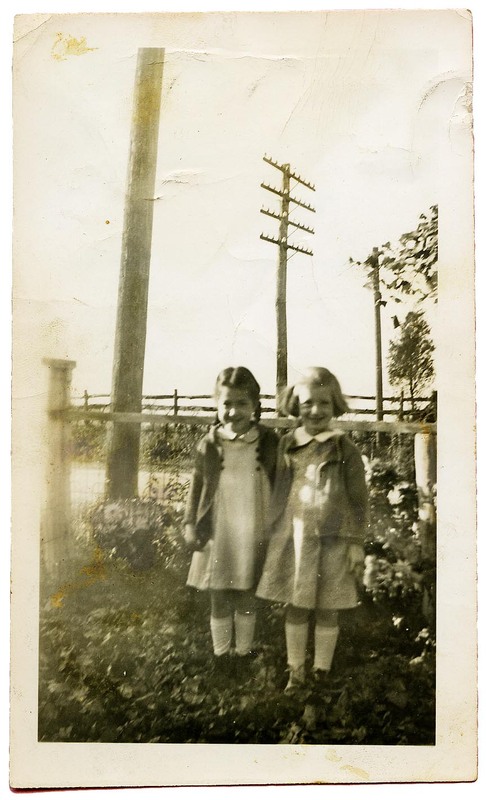 Cousin Sammy likes to tease me, but his sister Janet takes me on walks around the block because their house is in town, Middletown, Pennsylvania, my first taste of life outside of the country. After I reach school-age, summer is a time for the cousin exchange. My favorite summer visits are with Cousin Janet, of all the Metzler cousins the one closest in age to me. I am fascinated with her strawberry blond hair and lighter skin. All of my family have an olive complexion, dark hair. We play with fat, sticky strands of Cinderella hair on our dolls and make up stories upstairs in the small bedroom. Soon Mom will call us down to the kitchen for root-beer floats sipped with plastic straws probably saved from last summer. The next time I go to Janet’s house for a week in summer, I fall off my bicycle onto the gravel, grinding sharp bits into the skin around my kneecap. Though the bruise starts to recover, I don’t bounce back from the tumble. In the day or two following, I have crying spells, so Aunt Jenny calls my parents. When they pick me up, I feel both embarrassed and relieved. Tell us your summer vacation memories. We’re all ears. I loved this mini-summary of your summers from carefree naked toddler in the tub to self-conscious preadolescence. The photo of you in the galvanized tub is wonderful! I laughed at your comparison to the Manet, and imagined the shock if your Mennonite family actually reenacted it. 🙂 Weird coincidence that I just discussing that painting with a friend last week (she was having an outdoor luncheon for her French club). What fun memories (well, not the crying) of family and summers long ago. Thank you for sharing, Marian, it was a nice break from reading about 18th century life! I remember the bucolic scene in the Manet painting from my art history course, but I didn\’t recall that the picnickers were actually au naturel. Funny how the mind deletes certainly things. You can count on my blog to provide down-home breaks from your scholarly pursuits, which I admire. Thanks for your musings. I always enjoy your take, Merril. Selective memory or selective forgetfulness? I enjoy all these old pictures that you share. some of them seem to be still very clear. So many of mine have faded. I\’m happy you enjoy the picts, Shirley. Some of mine are still clear, but most are somewhat faded. Here\’s the secret: I have a little help from my PhotoShop friend to sharpen or darken when needed. Thanks, as always, for paying attention. 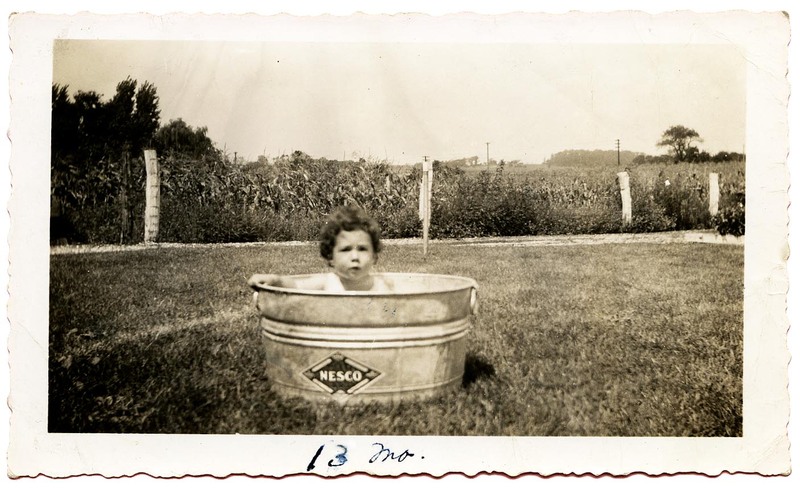 Loved the tub photo … have a similar one of me when I was about two … although I don\’t think it was necessarily a summer photo. You must have lived in a warmer clime then, Mary. Tub photos like these were possible only June – September in Pennsylvania. They were a lot cheaper than the fancy-doodle plastic blow-up kind kids have nowadays. Photo-shopped? Now that\’s an idea! Loved this Marian thank you! It\’s got me thinking … and now that winter is here in the Southern Hemisphere, what better time to be thinking of summer :). Our parents would take us as children on grand adventures – bundu bashing, wild rivers with snakes swimming in them… camping out under the stars, scorpions in our shoes or under the pillow … ok enough already.. work to attend to! Bundu bashing (What\’s that? ), snakes in wild rivers, scorpions in your shoes – that is the stuff memoir is made of. I guess we\’ll hear about your summer time activities in December. Thanks for always adding your unique perspective, Susan. Galvanized tub strikes a chord with others, I see. Me too. I\’ll have to see if I can dig one up (photo that is.) A perfect swimming hole when nothing else was available. We also had a pond. Yes, I do think the living was easier but then little outcroppings of difficulties nibble at my memory. I remember farm ponds, but not our own, Melodie. The Hilshers a few miles away had a pond, and I remember sinking in almost to my shoulders and then curling my toes around the slimy ooze as I walked around in the water. As you well know, photos are such great prompts for memory. “Outcroppings of difficulties nibbling” at your memory? Yes, there were plenty in my case too, but some of this I seem to gloss over with the hazy layers of time. I remember washing our dog in a galvanized tub. The photos reminded me of so many I have and it\’s fascinating to see how similar, yet different, our childhoods can be across this great country of ours. Little pockets of culture and natural influence prevails and brings a unique touch to each of our lives. Thank you so much for sharing your world. It\’s always a joy to pay a visit. And it\’s always a joy to have you stop by, Dorothy. I guess living in a similar era makes some of our connections possible though culturally there may be big differences. I liked your distinction better a simpler vs. an easier life. My father and grandparents\’ way of life involved backbreaking work, but it was straightforward. I admire the level of patience and perseverance that working a farm took and often wonder if I could withstand such grueling labor. Then I wonder what my grandmother would think of grading papers for hours each day. Such a different way of life just two generations later. Every generation seems to take giant leaps, and I don\’t know whether to assess them as forward, backward, or sideways. Anyway, it\’s always a new direction with pros and cons for each one. Such a thoughtful comment, Traci. Thanks! Holy Toledo — that\’s one heckofa l-o-n-g picnic table! And I love that the galvanized washtub was multi-functional: baby bath/play time AND blanching ears of corn! My all-time favorite summer memories were of my dad taking us to pan for gold. No kidding! He\’d do his research to find out where we would most likely \”strike it rich,\” and off we\’d go with the camper in search of the ever-elusive nuggets of gold, or better yet, a vein. We never did find it, but we struck the Mother Lode in rich family memories. I love your exuberant outbursts, Laurie. You have enough positive energy to make the world turn on its axis a little more happily. Panning for gold is a happy family memory, Laurie. The nuggets-vein-mother lode progression is just dandy. You have obviously inherited your dad\’s adventurous spirit. \”Have a shiny penny (copper) kind of day,\” as you might say! Ahh…summer time. No school work for me. Not that I did much of that anyway. About every summer my family would pick a state park (somewhere in WA, Oregon or Montana) and we would go camping out with some of our friends, relatives or church friends. It was a great time: smelling the damp earth, the shady tall evergreen trees, a smokey campfire burning into the late night, trying to get rid of sticky marshmallow residue on your fingers after eating S\’mores, earthy canvas tents. And of course just eating the same old food one might eat at home somehow seemed a little more exotic placed on heavy-planked picnic tables. What about those bears, Cliff? We\’re all ears! Those pictures of you are adorable! Regardless of how ancient the photos or un-evolved the photography, the essence is there. We are an interesting pair, you with state-of-the-art equipment and a professional eye; most of what you see on this post are photos probably taken by my mother or an aunt with a Brownie-type camera decades ago of course. I certainly remember those summer family picnics. My grandfather on Dad\’s side, my uncle on Mom\’s and my brother all had birthdays in July (11, 12 and 15) So mom would organize a huge pot luck picnic at Elkwater Lake with relatives from both sides . It was always so much fun. Your July sounds like ours as far as birthdays are concerned. I was born the day after my mother\’s birthday, our son was born two days after mine, a grand-daughter has a birthday the previous week, and on and on it goes with Grand-nieces, friends. Elkwater Lake sounds like the perfect picnic place. I\’m guessing there would be water sports too and maybe even fishing. Beautiful family photos, Marian. They do take me back. 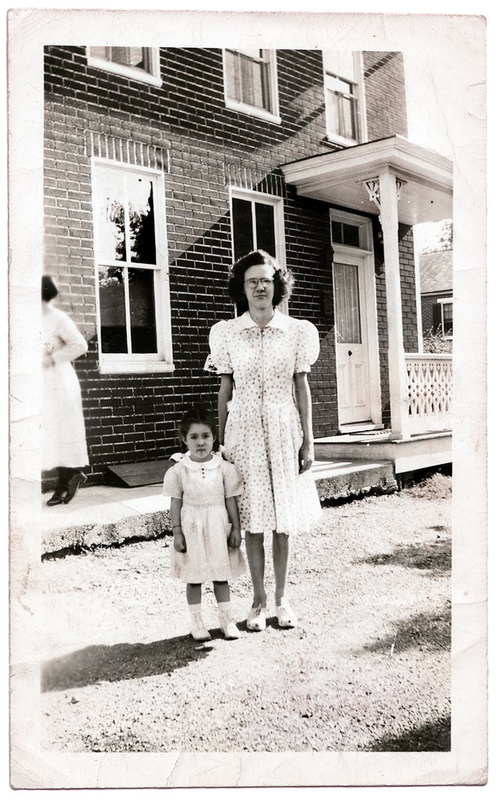 One of my favorite summers was the week I spent at my Aunt Martha\’s home outside Shippensburg. I always referred to the place as Three Square Hollow, but I\’m betting that\’s not actually the name. She had a big family and I loved hanging out with them. My cousin let me drive his car. I didn\’t have a license. That had a farewell party for me. What fun! Driving a car without a license and a big party. Wow, I would say you fared quite well. It\’s nice to hang out with you at the Corner of Nostalgia and Reminiscence Street. Bless you, my child! You found me here.